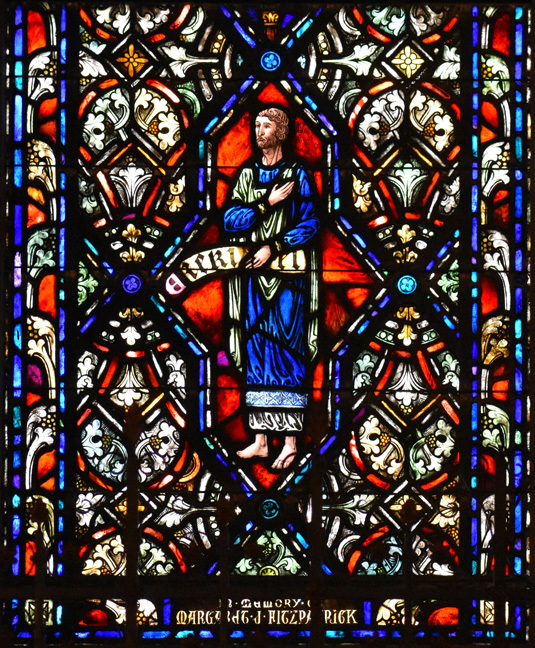 Brief Description of Subject: One of a series of four windows. each consisting of three medallions, in the sanctuary showing the roots of the Mass in the Old Testament. A. The Liturgy of the Word --- which consists of three readings (words of God) from the Scriptures. The bottom medallion will illustrate this with an Old Testament prophet -- one chosen to speak God's words. B. The Liturgy of the Eucharist --- BREAD and WINE is changed into the body and blood of Jesus and offered to God for the forgiveness of our sins. 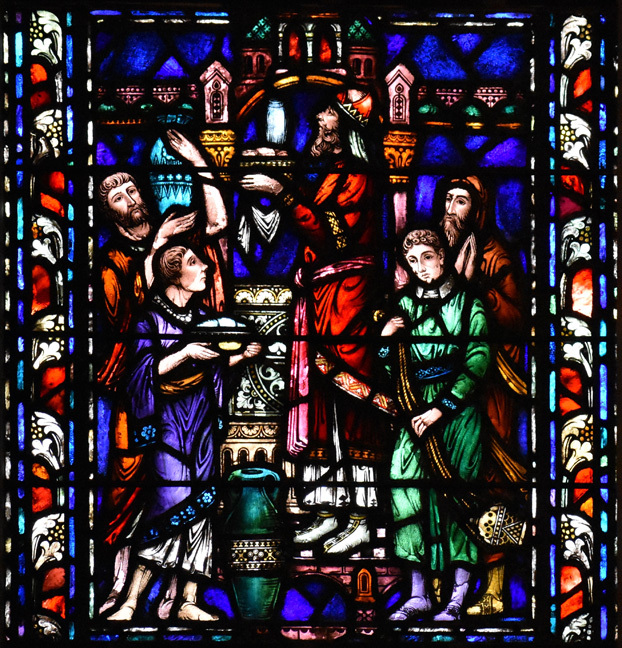 This is made clear in the Eucharistic prayer, referring to the "Holy Bread of eternal life and the Chalice of everlasting salvation", the priest prays "Be pleased to look upon them, as you were pleased to accept the gifts of your servant Abel, the just, the sacrifice of Abraham, our father in faith, and the OFFERING OF YOUR HIGH PRIEST MELCHIZEDEK." The middle medallion will depict this with offerings from the Old Testament. The Catholic Mass is performed by a priest. This is illustrated in the top medallion which depicts a priest from the Old Testament. 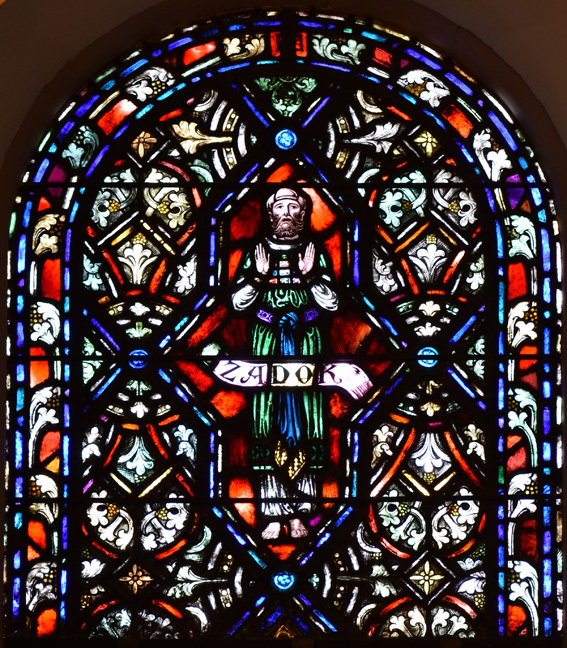 The bottom medallion of this window depicts Ezekiel. His name is inscribed on a banner that he is holding --- which symbolizes that he is a prophet. He is enclosed in a 12 sided geometrical figure which symbolizes the 12 tribes of Israel. The middle medallion pictures the "Offerings of Melchizedek" and is covered in Gen.14:17-20. Abram was returning home after rescuing Lot and had stopped to meet the king of Sodom "Then Melchizedek bringing forth bread and wine, for he was the priest of the most high God, Blessed him and said: Blessed be Abram by the most high God, who created heaven and earth." The top medallion is inscribed with the name "Zadok". Zadok was the first high priest of Solomon's Temple. He is seen wearing the "breastplate of judgment" which is described in Exodus 28:15-17. He is enclosed in a 12 sided geometrical figure which symbolizes the 12 tribes of Israel.